Com o passar do tempo, a lã transformou-se na minha matéria prima favorita. Embora não a use em todo o seu espectro (não tricoto, por exemplo), aos poucos venho a descobrir-lhe as possibilidades, vantagens e muita beleza.Sempre quis observar o processo de tratar, cardar e fiar a lã artesanalmente, e tive essa possibilidade na visita à Casa de Trabalho do Nordeste, em S.Miguel. Entenda-se que as ferramentas estão visíveis em muitos locais, museus inclusive, mas olhar para elas sem saber como funcionam é, no mínimo, inútil. Na Casa de Trabalho produzem peças tradicionais, frequentemente com destino a grupos folclóricos, desde o momento em que recebem a lã cortada das ovelhas, passando pelo tingimento, pela tecelagem nos teares tradicionais manuais, até à confecção da peça final. Nesta imagens vê-se a lã no estado original, proveniente de ovelhas locais, já lavada. De seguida é desfiada, escolhida e cardada com os dois pentes (os utilizados aqui são importados do Texas, por impossibilidade de se encontrar peças com qualidade produzidas localmente). Depois de escovada, está pronta para ser fiada. Ao contrário do que tenho visto, esta máquina não tinha pedal para fazer a roda girar. A fiadeira alternava entre alimentar o fuso com a lã e fazer girar a roda que puxa o fio, continuamente, como numa dança. A lã ainda solta agarra simplesmente o fio do fuso, que ao puxá-la a faz girar sobre si própria produzindo mais fio. A lã fofinha a ser transformada num fio rijo lembrou-me um processo inverso àquele que transforma açúcar sólido em algodão doce. Durante a visita não tive tempo sequer para começar a perceber como se começa a tecelagem do tecido e manobra o tear. Fiquei-me pelas fotografias e pelo desejo de aprender a trabalhar com um tear artesanal, num futuro próximo. Na última imagem vêem-se as barras decorativas de algumas saias tradicionais, umas das quais a ser feita em “ponto alto”. As time went by, wool has become my favourite material to work with. Although I don’t use it in all its varieties (I don’t knit, for example), I have come to discover many of its possibilities, qualities and beauty. 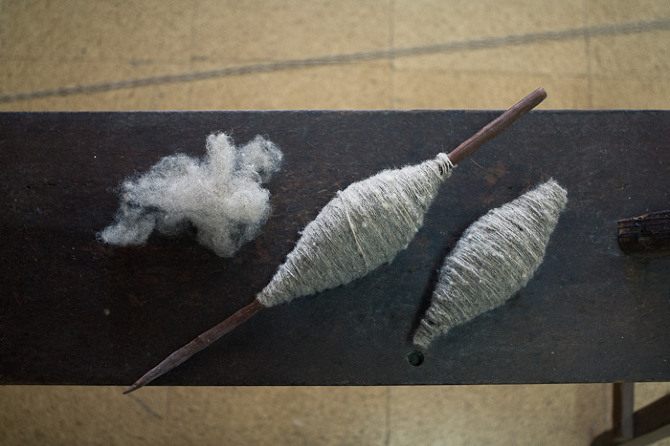 I’ve always wanted to observe the process of cleaning, combing and spinning the wool entirely by hand, and I was able to see it at the Casa de Trabalho in Nordeste, in S.Miguel - Açores. It’s important to understand that although the instruments are easy to find, even in museums, I think it’s useless to look at them not knowing exactly how they work. 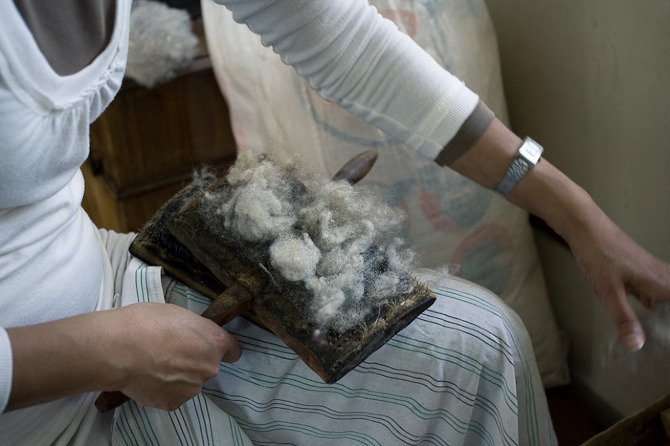 At the Casa de Trabalho they make traditional garments, usually aiming at local folcloric groups, from the moment they receive the wool cut from the sheep, to dyeing, weaving and sewing the final piece. 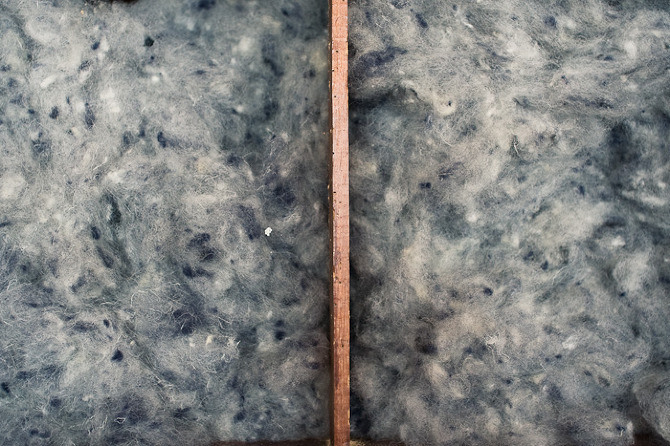 In these photos we can see the wool as it is, just cut from the sheep with a pre-wash. Next, it will be hand frayed and combed with two wool combs (these are imported from Texas, as they can’t find anyone who can make them with quality, locally). 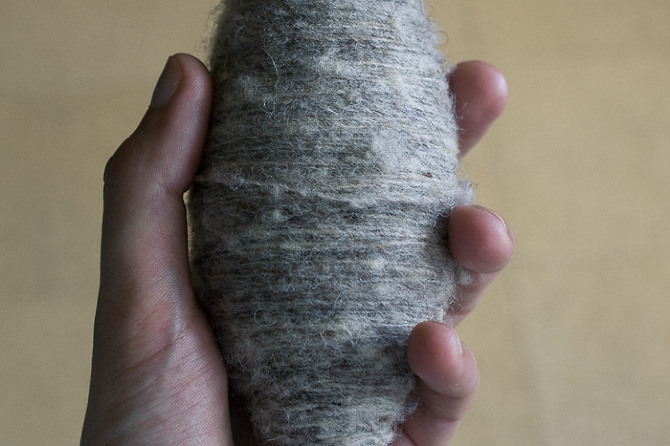 After the combing, the wool is ready to be spinned. Unlike what I have seen, this spinning device did not have a pedal to make the wheel turn. The spinner just dances in between feeding the wool to the yarn and spinning the wheel. 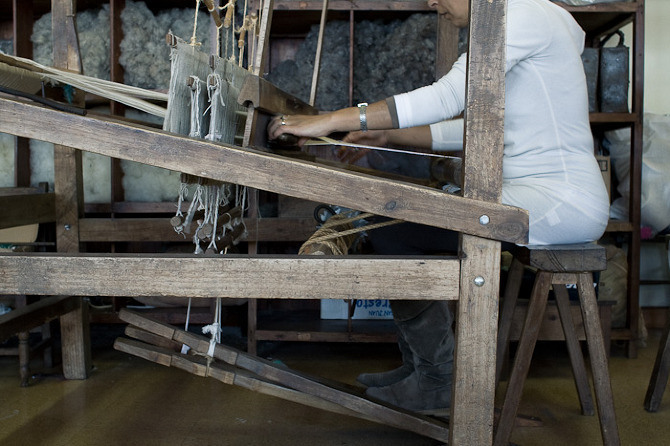 The loose wool simply grips the yarn, that makes it spin and turn on itself, making more thread. The fluffy wool being transformed into thread somehow reminded of an inverse process to the one that turns hard sugar in cotton candy. During my visit I didn’t have time to even start to understand how to weave the fabric and work the loom. It’s something I really want to learn in a near future, though. In the last images, we can see the decoration for a few traditional skirts, one of them being weaved in “ponto alto”.